Designer Daniel Hernandez shows the back of his sequined women’s top at Fabutique in West Roxbury. Daniel Hernandez dispenses advice about festive attire with a directness that’s as sharp as his sewing shears. Well, OK then. That said, mix-and-match separates are the way to go, he says. They have more versatility and long-term appeal. Hernandez’s eyelash top under a jacket with his belt. He points to a sleeveless black top covered in the front with delicate metallic threads creating an eyelash effect, suggesting the versatile piece can be worn solo to dinner with friends or under a blazer for an office party. “It doesn’t have to be sequins to be holiday,” he says. Taking the eyelash top off the hanger, Hernandez says the back of the garment is as important the decorative front. Made of a soft stretch material, it allows for that extra helping of yams or second cocktail. “It’s all about being comfortable, and not worrying about things fitting when you’re eating and drinking and hanging out with friends,” he says. In keeping with the comfort theme, Hernandez says adjustable belts are a stylish lifesaver this season. He makes his point with a black leather belt that expands and contracts with a sliding mechanism. Though rhinestones remain a sparkle staple for the holidays, metal (nickel, stainless, even copper) details are even more on-trend. “If you gain a couple of pounds or lose a couple of pounds, you don’t grow out of your belt,” he says. Edgier options abound, and Hernandez counts a shimmery legging as one that is worth the bold move. Anyone who plans to sneak extra slices of buche de Noel can appreciate the value of Spandex this time of year. But Hernandez cut his legging as a cigarette-slash-tuxedo-pant to create a more sophisticated feel. “You don’t want them to look like cheap exercise leggings,” he says. Those searching for a slightly sexier look should entertain the idea of a leather legging or ones with motocross detailing at the knee. Thankfully, Hernandez incorporated a zipper at the ankle to give the legging a subtle punk vibe while also making them easier to get on. Hernandez, who was born in Colombia and owns DH Studios Inc., in the South End, says the season is ripe for fashion faux pas as women often take an over-enthusiastic approach to sequins and flash. Smaller sequins — and fewer of them — is always the best option. “When you have it on the wrong part of the body — hips and bosom — it can be too much,” he says. Marika Gaurenszky said her Fabutique clients appreciate Hernandez’s holiday mix of pragmatism and style, describing the mashup as “cute, but easy.” One customer bought a feathered eyelash top to pair with a houndstooth pencil skirt to wear to a Christmas wedding. 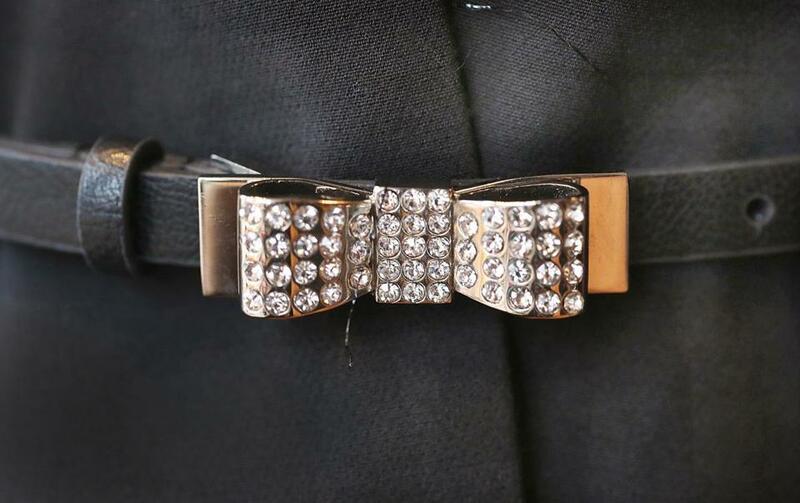 Belt made by Daniel Hernandez.